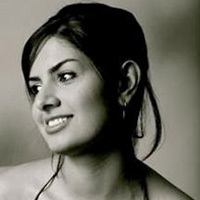 Described as "stark" by WNPR, Iranian composer Nourbakhsh's music has been commissioned and performed by Symphony Number One, Spark and Echo Project, Women Composers Festival of Hartford, Pianist Erika Dohi for Metropolis Ensemble Piano Series, Calidore and Cassatt String Quartets, and Invoke Quartet at numerous festivals, Atlantic Music Festival, Seal Bay Festival of American Chamber Music, SPLICE institute, New Music for Strings, MusLab electroacoustic festival in Mexico, University of Tennessee Contemporary Festival and more. Nourbakhsh is founder of Iranian Female Composers Association and a strong advocate of music education. She has worked as the site coordinator of Brooklyn Middle School Jazz Academy sponsored by Jazz at Lincoln Center. She is currently a Teaching Artist for NY Philharmonic Very Young Composers program and teaches piano at Brooklyn Music School. This summer, she is working with Akropolis Reed Quintet for a new piece as part of I-Park Foundation Artist in Residence. Nourbakhsh is a Global Citizen Scholarship recipient of Goucher College as well as a Mahoney and Caplan Scholar from University of Oxford. Among her teachers are Lisa Weiss, Laura Kaminsky, Daniel Weymouth and Daria Semegen. She is currently pursuing her Doctorate degree in music composition at Stony Brook University under the supervision of Sheila Silver. Since 2004, the Young Composers Competition (YCC) sponsored by Arden and Harry Fisher at the Community Music School of Webster University has recognized and encouraged the efforts of those between the ages of 12 and 21 who are involved in the creative process of composing music. This program, unique to the St. Louis region, is an open competition which has received submissions from St. Louis and throughout the nation. Each year the guest composer plays an integral role within the YCC, providing developing composers with invaluable one-on-one guidance in a constructive and supportive environment from an individual already well established in their professional and creative field. In addition to meeting with each winning young composer and reviewing their work, the guest composer engages intellectually with attendees via a public presentation on a musical topic relevant to their artistic pursuits and the professional development of the young composer. A work from the guest composer is also featured during the culminating concert of the YCC winning student works. The choice of guest composer is based upon recommendations from the YCC committee, past participants of the competition, and a general keeping of ears to the ground for exciting new voices in the new music world. "Since taking the reins of the YCC two years ago, I have striven to engage composers who are active in both the creation of exciting new work and the education and guidance of young minds, but who also hail from backgrounds not traditionally so well represented in the composition world. There are so many brilliantly diverse voices singing their unique perspectives and it is paramount that we share that with the promising young musicians we host," says Justin Blackburn, coordinator of the Young Composers Competition. Entries are currently being accepted for the 2018-2019 Young Composers Competition. Interested composers should visit webster.edu/community-music-school/programs/young-composers-competition for more information. The deadline for submissions is Oct.19, 2018 and winners are announced no later than Jan. 9, 2019.